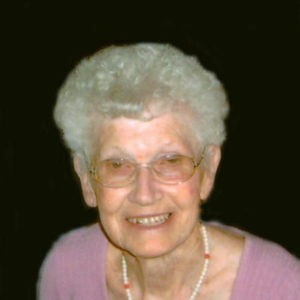 Dorothy Griffin, 88, Fargo, ND, formerly Wahpeton and Wyndmere, ND, passed away Sunday, April 14, 2013, at Rosewood on Broadway in Fargo. The Funeral Service will be Friday, April 19, 10:00 a.m., at Peace Lutheran Church, Barney, ND. Visitation will be Thursday, from 4 PM to 7 PM with a 6 PM Prayer Service at Vertin-Munson Funeral Home, Wahpeton, and one hour before the service at the church on Friday. Interment will be at Peace Lutheran Cemetery, Barney. Dorothy Leona Mindeman was born on March 23, 1925 to Helmuth and Selma (Kressin) Mindeman. She was raised near Barney, North Dakota, graduated from Wahpeton High School and Valley City State Teacher's College. She taught school in Danton Township. She was united in marriage to Jack Griffin on September 21, 1947. They farmed in West End Township near Wyndmere until moving to Wahpeton in 1975. She worked as a nursing assistant at the Leach Home in Wahpeton for many years. In their retirement years, Jack and Dorothy spent many of their winter months in Mesa, Arizona, where they enjoyed square dancing, card-playing, and socializing with their friends. In 2008 they moved to The Evergreens in Fargo, where they resided until Jack's death later that year. She made her home at Sheyenne Crossings in West Fargo until 2012, when she moved to Rosewood on Broadway, where she resided until her death on April 14, 2013. Dorothy was a lifelong member of Peace Lutheran Church in Barney, ND, where she taught Sunday School, Saturday School and Vacation Bible school and was active in LWML and quilting. She is survived by daughters Gail (Sherman) Waagen, Fargo, ND, Judy (Kirk) Rosin, Casselton, ND; son Larry (Debra) Griffin, Janesville, MN; ten grandchildren, three step grandchildren, 25 great-grandchildren and 9 step-great-grandchildren, sisters-in-law, Jerry Griffin, Kay Sheridan, and Ethel Griffin and many nieces and nephews. She was preceded in death by her parents, husband Jack, son Curtis, brothers Alvin and Marvin, sister Gerlinda (Linny) Luebke. May the peace of the Lord be with you. Didn't know your Mom well but always enjoyed a quick visit with her when you brought her to St. Andrew. Know we will see her again. Praise God!!!! Gail, Judy, and Larry.......On behalf of my mom Irene, and myself, we send our sincere sympathy to you and your families. We are just never old enough to lose the wisdom and love of our moms. Sending our hugs and wishing you God's peace. As an in-law, Dorothy always made me feel like part of the family. She will be missed! God bless all of you! What a wonderful victory for my precious Aunt (and Godmother) Dorothy! My sadness at her loss is overwhelmed at my joy that she is finally able to experience that joy she so looked forward to all of her life. The joy she felt here as she spent so many hours listening and talking to God through studying her Bible and praying unceasingly! We love you all and are praying for you. I would like to thank you for letting me get to know your mother. She was such a sweet little lady with the cutest smile. I am sure she is up in heaven now resting comfortably and happy to be among the other angels. Once again thank you and God bless your family.